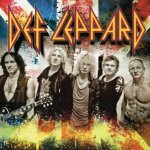 Def Leppard played a show in Helsingborg, Sweden last night and a third online review and photos have been posted. Expressen have posted a review of the show which took place at the Sofiero Castle. 1 photo is also included. The paper also helpfully confirmed the exact order of the setlist (although they apparently didn't stay on for Wasted!). "You guys are the best crowd we've met throughout this European tour, he says to those who shiver at the front when the clock runs down twelve and curfew."